A Lake Havasu City senator says he still has yet to be convinced that marijuana has any legitimate medical uses. But Republican Sonny Borrelli said Monday the fact remains that voters did approve legalizing the drug for medical uses in 2010 and more than 150,000 Arizonans have state permission to buy and use it. So he figures it’s the state’s obligation to ensure that buyers are getting a product that’s not tainted and, in fact, has the amount of psychoactive THC that buyers are promised. SB 1420 would give the state Department of Agriculture the same authority over marijuana as it now has over other plants offered for sale for consumption. That would give agriculture inspectors the power to inspect the cultivation facilities where marijuana is grown. More to the point, Borrelli wants what is being grown tested for what operators are using on the plants. “It’s the Wild West,” he said of the current state of marijuana regulation, with no rules on pesticides and other chemicals being used on the plants. But those same federal rules are silent on use on marijuana, meaning it can be used. Nothing in the legislation would ban any specific chemical. But it would require that when the marijuana is sold at the dispensary that buyers are made aware that it was used in the production. “I want to concentrate on customer safety,” he said. Moldy marijuana is a slightly different question. Borrelli said he’s been told it can be treated to get rid of any fungus rather than retailers having to toss out the plants entirely. At that point it could be offered for sale — along with information on how it was treated. But Borrelli’s legislation also has what might be considered the consumer fraud provision. “If they’re going to advertise there’s 20 percent THC and it’s only 5 percent, they need to relabel it,” he said. If approved, the measure would have another benefit for the more than 150,000 individuals who now have state-issued ID cards allowing them to purchase up to 2 1/2 ounces of marijuana every two weeks: More cash in their pockets. The original 2010 voter-approved legislation did not set a fee, leaving that up to the Department of Health Services to charge enough to administer the program. In fact, the law bars the proceeds from being used for anything else. The agency currently charges patients $150 for one of the cards, a fee that has to be paid every year. “It’s kind of hard to justify when they’re sitting on $40 million,” Borrelli said, with current Health Director Cara Christ having refused requests to lower the fees, even in the face of a lawsuit by medical marijuana users. Christ won the first round when Maricopa County Superior Court Judge Jo Lynn Gentry said she lacked the legal authority to declare the fees excessive, even with the health department running the program with a huge surplus. SB 1420 would lower that to $50 for the first year and $25 for renewals. His legislation also would give $2 million out of that health department account to the Department of Agriculture to start administering then program. The measure is being approached cautiously by the Marijuana Policy Project, the national organization that put the initiative on the 2010 ballot and worked to get it approved. But he said he wants to review it further before taking a position. “I’m particularly curious to see if there would be additional or unintended requirements or restrictions that come with medical marijuana being defined as an agricultural commodity,” Fox said. 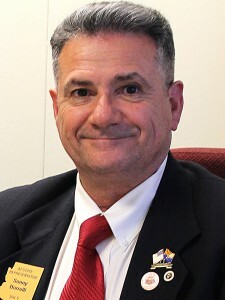 It also appears to have the cautious support of Maricopa County Attorney Bill Montgomery who has waged repeated unsuccessful efforts to have the Arizona initiative voided because it runs contrary to federal law where possession of the drug remains a felony. Because the Arizona Medical Marijuana Act was enacted by voters, it can be amended only with a three-fourths vote of both the House and Senate. Borrelli already is moving to get that margin, getting another 78 of the state’s 90 lawmakers to sign on in support, including Senate President Steve Yarbrough and House Speaker J.D. Mesnard. But it also would have to survive a possible veto by Gov. Doug Ducey who said as recently as last week that he has seen no evidence that marijuana has any legitimate medical uses.